The Cardinals have used 46 players this season; I wanted to breakdown different parts of the roster, like where we got them and the value of them (using WAR from Fangraphs). These numbers came from each player that played the position; so Greg Garcia was counted as a second baseman, third baseman, and shortstop. This causes the numbers to go beyond 46. Of course, the team used more pitchers than any other position, and it’s not surprising that outfielders were second (especially when you factor in injuries). I was suprised that we used 8 first baseman (Matt Adams, Matt Carpenter, Dan Johnson, Pete Kozma, Brandon Moss, Stephen Piscotty, Mark Reynolds, Xavier Scruggs); the injury to Adams is probably the main reason for this, along with the lack of suitable replacements. Of the 23 pitchers, how did they break down. 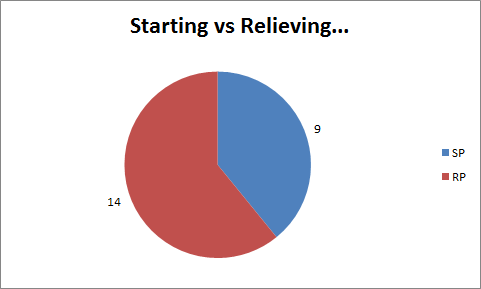 I went 2 ways with this; first was starting versus relieving. Now, I didn’t take into account spot starts by relievers or guys like Adam Wainwright that primarily started and saw a few relief innings. Again, common sense would lead to the assumption that a team would use more relievers, considering they carry more relievers than starters every day. The next breakdown is which hand they throw with. I fully expected the roster to carry more righties. You figure that most teams try to carry at least 1 lefty starter and 2 lefty relievers; I was a little surprised to see the team use 6 lefties this year. 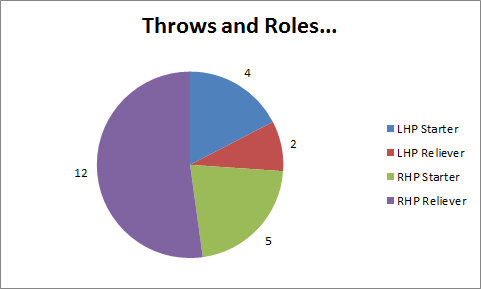 It got me thinking about breaking out which hand they throw with and their role. I expected righty relievers to be the bulk, which they were. I was not expecting that the team used almost as many lefty starters as righties (Lyons is listed as a starter, even though he did some relief work). The use of the draft to fill the roster is a pretty common story now for the Cardinals, but I wanted to see where we got all of our players; we had 4 categories: the draft, trades, free agents (both minor league and MLB), and international free agents (kids signed from foreign countries). As expected, the draft was responsible for over half the roster. I can see the almost even mix of free agents and trades. I was surprised to see only one international free agent (Carlos Martinez); the team has started to focus a little more on internatonal players in the last few years, so this number could climb in a few years. With the amount of publicity our drafts get, I wanted to see how that correlated to performance. 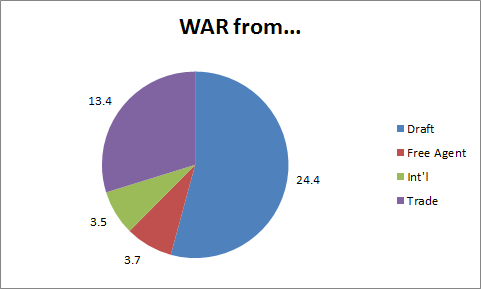 As expected, most of the team’s WAR comes from drafted players; while 24.4 is a good number, it’s a little over 1.0 per player drafted. 6 drafted players are worth 2 wins or more apiece for a total of 17.8 (Carpenter, 5.1; Lance Lynn, 3.0; Jaime Garcia, 2.8; Michael Wacha, 2.5; Kolten Wong, 2.4; Trevor Rosenthal, 2.0); they also have 5 players in the negative. The team gets much better results from the international market, but that’s only 1 player (Martinez) and doesn’t prove much. 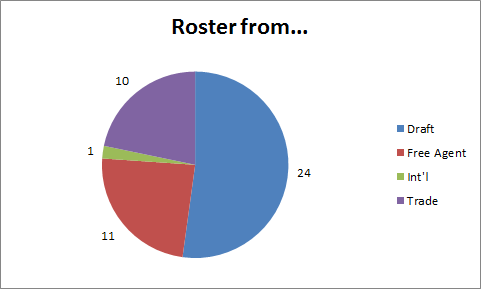 The best additions to the team came via trade, where they receive 1.3 WAR per player. This is mainly due to Jason Heyward (5.8) and Randal Grichuk (3.0). The flip side is Peter Bourjos (-0.3) and Steve Cishek (-0.2). Funny how both players from one trade are near the top and bottom. The least value comes from free agents; they have received an averaged of 0.3 WAR per players signed as free agents. Jhonny Peralta and Matt Holliday are leading the way with 1.9 and 1.1 respectively, while Johnson (-0.2) and Ed Easley (-0.1) bring up the rear as the only negative players. It’s pretty basic; the Cardinals gotten most of their players and value from the draft, but the best per player has been from trades. 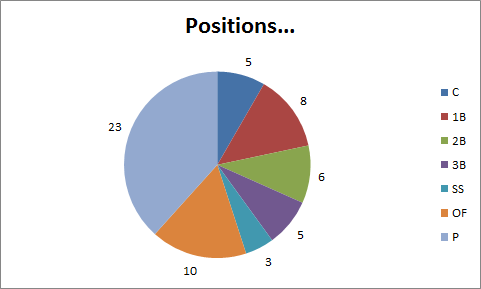 A majority of their roster has been taken up by pitchers, most of them right handed relievers; most of the positions players have been outfielders (as expected) and first basemen (a little surprising).